With different generation terminologies coming into the limelight with the inception of heavy internet usage, confusion has always been rife. Most individuals get into the confusion of which generation they belong to or even what it’s called. Some are not even informed that such names exist at all. With that in mind, it’s time to break the confusion. It’s time to draw the sharp distinction between two of such generations namely boomers and zoomers. Anyone who was born between 55 and 73 years is regarded as a baby boomer. Boomer is a term used in place of baby boomers and refers to the demographic cohort of individuals who came to be between the mid-1940s and mid-1960s. This generation precedes Gen X and follows the Silent Generation. The term was coined in relation to how the population boomed after the second world war. Most newspaper reporters used the name “boom” to refer to the population growth around that time. The first use of the word zoomer is in reference to Generation Z. In light of that, a zoomer is an individual who belongs to the demographic cohort that came to be between the mid-1990s and mid-2000’s. Little consensus exists on the actual dates though, but demographers and researchers put them at between 1995 and 2010. The second application is that a zoomer is a boomer with a Zip. 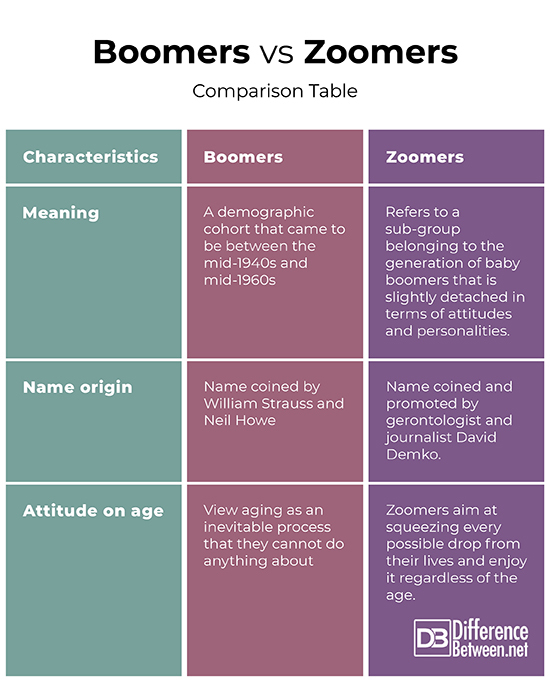 The difference between zoomers and boomers, as put across by Dr. David Demko shows that a zoomer is the opposite of a ‘traditional boomer’ who does not act their age but live their life. Understands the difference between primary aging (the inevitable one) and secondary aging (reversible). Performs daily exercises including neurobics for brain power, anaerobic for strength and aerobics for endurance). Achieves the necessary resources to live an adventurous life courtesy of sound retirement planning. Orchestrates social support systems for close friends, companions, and a confidante. Calculates caloric and daily nutritional needs based on their gender, weight, and age. Enjoys positive self-concepts and has a passion for living their lives to the fullest. Let us delve into the difference between boomers and zoomers (the boomers with a Zip). The name boomers was used by different personalities including newspaper reporters who used it in their stories after World War II. However, it is majorly associated with authors William Strauss and Neil Howe while zoomer was coined by gerontologist and journalist David Demko. Boomers and zoomers have varying attitudes towards various issues. On aging, for example, a boomer regards it as an inevitable process that they cannot do anything about it. Zoomers, on the other hand, view aging with a different angle and aim at squeezing every possible drop from their lives regardless of the age. 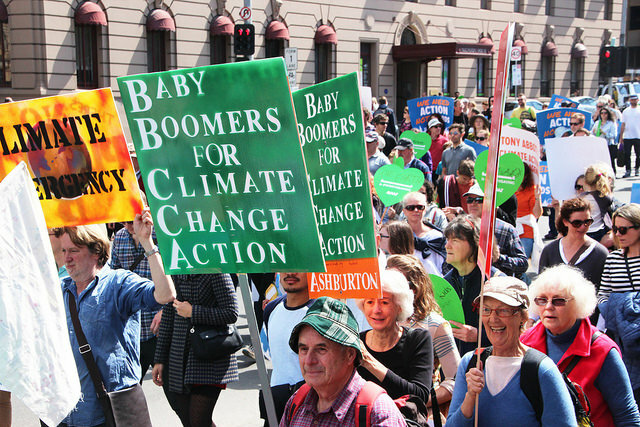 Traditional boomers are not good at planning for retirement and are poor in saving for such issues like healthcare while zoomers can plan for about 80 per cent of their income. The zoomers also have a hedge against inflation as well as money for their healthcare needs. A zoomer is well aware of diet, setting goals, nutrition, as well as being knowledgeable and engaged to maximize their lifespan. A boomer, on the other hand, is more inclined to just accepting that health and strength are subject to change due to aging. A zoomer is a boomer only that they have detached themselves from the bigger and traditional generation of baby boomers. The way they see and respond to situations, aging, their attitudes, personalities, and such other considerations as financial disciplines vary. However, as Demko put it, a zoomer is anyone born between 1946 and 1964 (when boomers were born), but with the varied traits, they become boomers with Zip. Sarah Brown. "Difference Between Boomers and Zoomers." DifferenceBetween.net. April 11, 2019 < http://www.differencebetween.net/miscellaneous/difference-between-boomers-and-zoomers/ >. "Are You A Boomer Or A Zoomer?". Selfgrowth.Com, 2019, https://www.selfgrowth.com/articles/Are_You_a_Boomer_or_a_Zoomer%20.html. "Boomers Vs. Zoomers ... It's All About The Attitude". Prime On The Web - Prime Magazine, 2019, https://www.primeontheweb.com/featurestory/boomersvszoomersit/. Professor David J. Demko, Gerontology. "ARE YOU A Boomer Or A Zoomer? 9 Ways To Live 10 Years Longer, Gerontologist Dr Demko Brands New Style Of Modern Maturity". Demko.Com, 2019, http://demko.com/zoomers.html.